The institute is a hybrid of the TUM Medical School (Chair of Molecular Allergology and Environment Research, campus Biederstein) and the Helmholtz Zentrum München (Institute of Allergy Research, campus Neuherberg), both forming together the Center of Allergy Research (ZAUM). 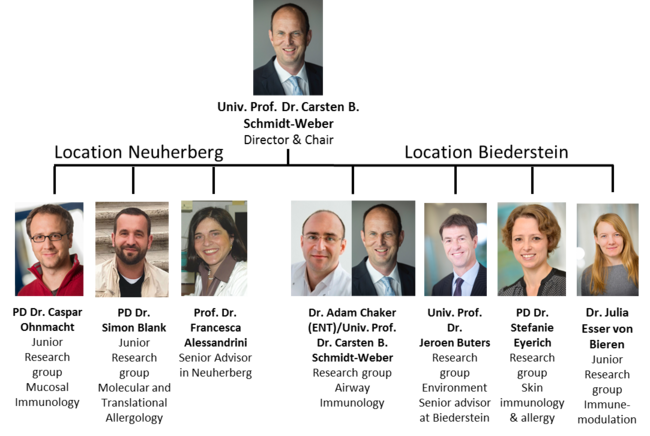 Research activities are coordinated by Prof. Schmidt-Weber and his senior investigators Prof. Jeroen Buters (Biederstein) and PD Dr. Francesca Alessandrini (Neuherberg). The research activities are driven by 8 independent research groups. The hybrid character of the institute reassures excellent cooperation with the TUM Medical School and Helmholtz Zentrum München and reassures the translational outcome of the institute.